I have an app on my phone that helps me track the food I eat. I enter the food and the amount, measured by volume, and the app calculates the nutritional information of what I have eaten during each meal. It is handy when trying to watch what you eat, but measuring by volume is not very accurate. Almost everyone that knows anything about weight loss will suggest you get a food scale. But a scale will require you to calculate the nutritional information on your own. I don't know about you, but I am not usually in the mood to do a little math before I eat breakfast in the morning. Wouldn't it be nice if there was a scale that would do the math for you at 5am? Well there is! 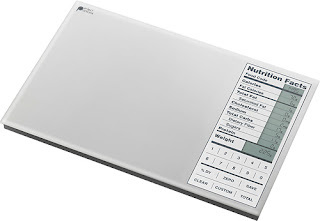 The Perfect Portions - Food Scale with Nutritional Calculator. The Perfect Portions scale weighs your food like a regular scale, but when you enter the food code for the item you are eating it will calculate the nutritional facts for you. It will even add up all of the items you use to prepare your breakfast, like oatmeal, milk, and blueberries, and give you the total for all of the items. No need to write down each individual item to keep track. It will tell you the total calories, calories from fat, carbohydrates, protein, fat, saturated fat, fiber, sugar, cholesterol, and sodium in the items that you have weighed. All of the facts make it handy when you're trying to watch your weight, control your portions, or if you have special health issues that requires you to watch your sodium or sugar intake. But because the Perfect Portions scale is also a scale, giving you measurements in grams and ounces, it is perfect for baking as well. My kids always love to use new gadgets, so right now I am using the scale to monitor snack time. I can get out a bag of baby carrots and put a bowl on the scale and give them a target for how many grams of fiber they have to eat before they can have the cookie they want to eat after school. I used to just assign them a number of carrots, but the addition of a gadget makes it more fun for them, which means less arguing for me. In addition to all of the food codes that come pre-programmed into the scale, you can add your own custom food codes for items that you eat on a regular basis. You select a code and enter the nutritional information from the label, and the scale will do all of the calculating for you. With a touch of a button you will know how many calories are on your plate and be able to adjust your portion sizes accordingly. The scale is amazingly accurate. It gave me the nutritional information for just two blueberries. I ate a lot more than two blueberries, but just wanted to see exactly what the scale would do. It comes in fun colors, too. I have the silver version, but it also comes in black, white, red, and blue. Who doesn't love a little color in their kitchen? The Perfect Portions - Food Scale with Nutritional Calculator is pretty perfect. Now all they need to do is create an app so I can look up the food codes when my daughter has walked off with my food code book. As part of BlogHer's Inspiration to Fitness challenge, I get to give away a Perfect Portions Scale to one of you so you can use it as part of your 2012 fitness journey. Leave a comment letting me know how you would use your Perfect Portions Scale to help with your Inspiration to Fitness, and you will be entered for a chance to win. Rules: No duplicate comments. You may receive (2) total entries by selecting from the following entry methods: a) Leave a comment in response to the sweepstakes prompt on this post b) Tweet about this promotion and leave the URL to that tweet in a comment on this post c) Blog about this promotion and leave the URL to that post in a comment on this post d) For those with no Twitter or blog, read the official rules to learn about an alternate form of entry. This giveaway is open to US Residents age 18 or older. Winners will be selected via random draw, and will be notified by e-mail. You have 72 hours to get back to me, otherwise a new winner will be selected. This sweepstakes runs from 1/25 - 1/31/12. Also be sure to visit the Inspiration to Fitness page on BlogHer.com where you can read other bloggers' reviews, get great fitness tips and find more chances to win! You can also click on the Best Buy image at the top of my blog to view a calendar of all the Inspiration to Fitness content. Good luck! Best Buy does not sponsor, endorse, approve, or have any responsibility for this promotion. Disclosure - This is a compensated review from BlogHer and Best Buy. I received a Perfect Portion Scale to use for the purpose of this review. All opinions are my own. I need this! This is where I fall short on dieting - portion control. I love that this adds up alot of things all at one time. What a time saver. Right now, I track everything separately! I'm a diabetic, and should know this by now, but don't, and have trouble following things. This would SO help me! I'd love to win, thanks for a chance. What an amazing device. This would definitely help me in eating better! What a great product! It's hard enough trying to lose those unwanted pounds...this would help keep things on track. Nice!!! Using this, I would be more motivated to not finish a carton of ice cream in one day. Haha. Portion control woohoo! I would love to learn more about portion control and this scale would be so helpful! I'm pretty good at not eating too much, but I definitely need more balance and more protein. Thanks for the giveaway! So this could make me more accountable. Great idea! What a great tool. Hooray for technology! I am terrible at math and it shows in my half-hearted calorie counting. This would really help. I have been a habitual over eater for 31 years. Not necessarily because I was just a greedy eater, but because I honestly did not know any better. I am trying to get healthy. The hubby has lost 70 pounds and I have lost 30. He is better at size and nutritional calculations where for me… I am just lost. Taking out the guess work would be a HUGE help for both of us to get closer to our normal body weight. I still have 145 pounds at least but on my way! I am currently working towards my nutrition major. The perfect portion scale would be a valuable teaching tool in my home! Oh do I definitely need this!!!!! I definitely need this so I can know exactly how much I'm eating. I would love to win this scale because I have been using MyFitnessPal to track calories, but I always have to guestimate portion size! I should eat, so this would really help me figure out the portions! Oh, I so need one of these. I've lost 90 lbs so far but need greater accountability to get off the last 30 lbs. This would be great for tracking! I'm trying to slim down and bulk up. This could help me make sure I'm getting the amount of protein I need to get the results I want. I'm trying to slim down and bulk up. So this could help me make sure I'm getting the right amount of protein I need for max results. This would help me soo much with portion control as it's so much harder to fudge a number on a scale! It is so sleek too! This would be great for encouraging me to cook more as well. I have a food scale, but it's cheap and I don't think it's very accurate. I have a tendency to just dump ingredients when I cook. This scale would be good because it would make me think about how much fat, starch, etc I'm actually adding. I would love to win this! It would really help me to figure out how much is actually in my portions- which might help me with portion control! Right now I eat relatively healthy, but I eat A LOT. If I had this scale, it might help me to cut back on how much I eat by knowing exactly how many calories I'm putting in my mouth. Thanks! I need all the help I can get and this would be perfect! I have the hardest time guessing how much food is in a serving! This would be such great help for me as I have been really struggling with Brittle Diabetes and many of the complications for 40+ years. It is really difficult to change dietry habits that I had been taught to follow religiously for so long now only to find that things have changed, again. Life is soooo much in the too hard basket at the moment and after losing my dear friend recently through bad diabetes complications I really don't want to go the way she did. Very, very sad.